Beautiful map representing part of Long Island City, New York. Ravenswood, Part of Long Island City, Queens, Co. L.I. A scarce example of Fredrick W. Beers' map of Ravenswood, Long Island City, Queens, New York City. Published in 1873, the map details Ravenswood, part of Long Island City, Queen from the East River to what was then 6th Avenue. Bounded on the north by Broadway and on the south by Webster Avenue. Detailed to the level of individual buildings and properties with land holders noted. 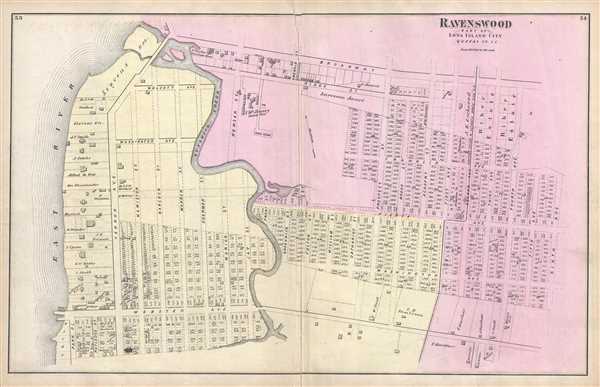 This is probably the finest atlas map of Ravenswood and the Newtown area of Long Island City, Queens, New York City to appear in the 19th century. Prepared by Beers, Comstock & Cline out of their office at 36 Vesey Street, New York City, for inclusion in the first published atlas of Long Island, the 1873 issue of Atlas of Long Island, New York. Very good. Some damage along original centerfold, particularly near top margin. Repaired on verso. Some edge wear. Spotting and toning at places. New York Public Library, Map Division, 1527284. Rumsey 0066.034. Philips (Atlases) 2202.